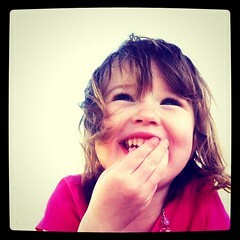 Sponsor Eliza for St. Jude Children’s Hospital Trike-a-thon! Eliza and the Sewanee Children’s Center are participating in the St. Jude Trike-a-Thon to raise money for St. Jude Children’s Research Hospital. Not only is the Trike-a-thon an opportunity to give to an awesome charity, it’s also part of a campaign that teaches riding safety. You can sponsor her in any amount, no matter how small. Eliza participated last year, and was determined to take part, even though at the time she could barely reach the pedals of the trikes. She rode 2 laps last year, which was a huge accomplishment…she still talks about it a year later, and is excited to be doing it again. Below is a Paypal button connected to my Paypal account. After the Trike-a-Thon this Friday (Apr 29, 2011), I will deposit any money in the account directly to the charity, and I will match the first $50 of donations dollar-for-dollar. Your donation is a flat amount, not a per-lap, and any amount, even $1, is greatly appreciated. Thanks for your generosity, and for helping both Eliza and St. Jude. Our annual trip to Rosemary Beach was a huge success. 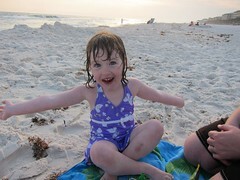 Eliza absolutely loves any body of water, so she was thrilled with the ocean and the swimming pool. We also loved getting treats at the Sugar Shak, meeting the Easter Bunny, doing the huge egg hunt, listening to music in the parks, and shopping at Gigi’s toy store. We also spent some time at Alys Beach for a tea party, where Eliza met Alice, the Mad Hatter, and the white rabbit. We even spent a little time shopping and hanging out in Seaside, another wonderful little beach town. All in all, a great little vacation that we all needed! 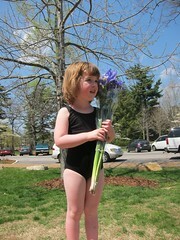 Eliza did an amazing job during her first dance recital. Her first (but undoubtedly not the last) time on a big stage. She was fearless. In fact, she loved the whole experience. And she looked adorable as a caterpillar dancing to “Under the Toadstools” from Alice in Wonderland, which is one of her favorite Disney movies (the cartoon). We’re so proud of her, especially all the hard work she has done during rehearsal and the tough lessons of working in a group, being part of a “team,” etc. It has been teasing us, coming in and out, but Eliza is loving the idea that Spring is (sort of) here. If it’s even close to 70 degrees, she’s begging to wear a sun dress. She’s excited about all the fun things coming up in April: her first dance recital, a trip to the beach, local festivals, egg hunts, and a trip to KY to visit our family. 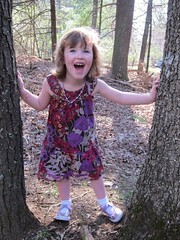 Mostly, though, she loves digging in the dirt and finding worms (in her dresses and sparkly shoes). She also loves to plant and water flowers. If she could live outside, I believe she would. What a fun girl. IMG_1260, originally uploaded by griffey. Both Betsy and I have been busy beyond all knowing, which only partially explains why we haven’t blogged over here at BNW for awhile. 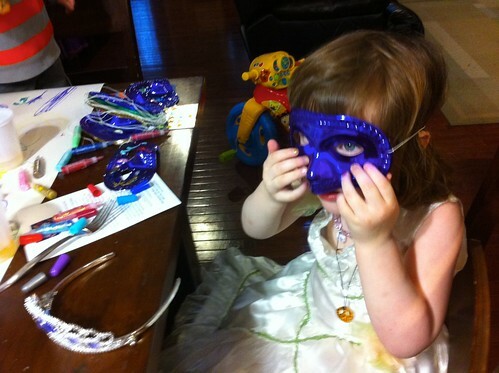 This was a huge week for Eliza…Tuesday was Mardi Gras, and her preschool had a parade for the kids. They got to walk up the street and throw candy and beads and such to the elementary school kids, all in costume and everything. Eliza _loved_ it. So this photo isn’t great, because in addition to awesome gifts, she also got a sinus infection for her birthday and wasn’t feeling well (Dec. 15th). But in the tradition of this blog, I wanted to give a quick overview of what Miss Eliza (“Princess Eliza,” if you please) is like at the ripe old age of three. Likes: playing dress-up, books, made up stories, playing in parks or at the gym, Disney movies of all kinds (even the scary ones), playing games on the iPad, playing with “lovies” (stuffed animals), playing in the dark (no kidding), cooking with mom and dad, role play of any and all kinds, singing, dancing, talking, asking questions. Dislikes: too much noise, kids who hit/push and other social no-no’s, wearing clothes that she doesn’t deem “fancy” enough, eating breakfast, falling down. Favorite media: changes quite a bit. Right now she prefers long movies over TV shows. Current favorites are The Wizard of Oz, Jungle Book, Emperor’s New Groove (yuck), Nightmare Before Christmas, and Monsters Inc. What can I say…she likes dark things. I think she likes to be scared a little bit. That explains her love of Halloween, too. Milestones and changes: Can tell stories, narrate in the past, ask complicated questions, use huge words (she LOVES adverbs), and carry on a conversation about anything with anyone. Is finally wanting privacy in the bathroom. Can run like the wind, but still falls down quite a bit. Is managing her anger / frustration so much better these days; she even has invented her own technique for calming down (it’s a visual thing, I can’t really describe it). Can recognize quite a few letters of the alphabet, count up to about 18 or so and do some simple math, knows all colors, most shapes, can tell you where she lives, understands family relationships. She is absolutely amazing. One of the most observant kids I’ve ever been around, and she simply stuns me with her sense of humor, deep thoughts and questions, and her love of life. She’s so much fun to be around. I can’t wait to see how she keeps growing up! IMG_2612, originally uploaded by griffey. 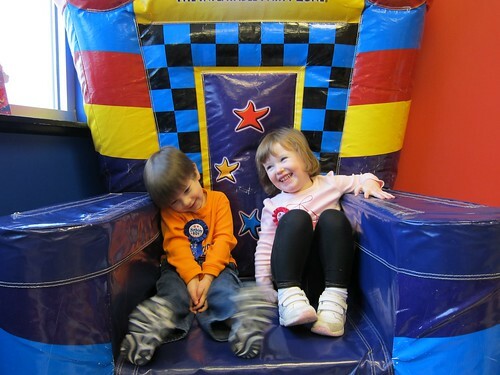 Eliza and Parker are now 3! It’s a cliche, but it doesn’t really seem possible. Eliza is growing into a really amazing girl…happy, vibrant, and just smart as hell. 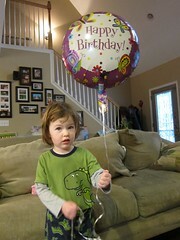 Happy Birthday, my awesome girl. 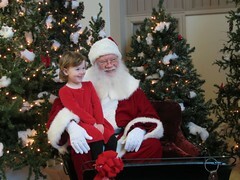 She loves to be the center of attention, and getting her photo taken with Santa at the Chattanooga Choo Choo was no exception. He seemed charmed by her, and honestly, who wouldn’t be? She’s adorable, if I do say so myself. IMG_0606, originally uploaded by griffey. Not sure how I got myself a Princess, but there you go. Best. Pic. Ever., originally uploaded by griffey. Well, this past week Eliza got to live out a huge number of little girl fantasies, as we spent the week at the Magic Kingdom in Disney World. 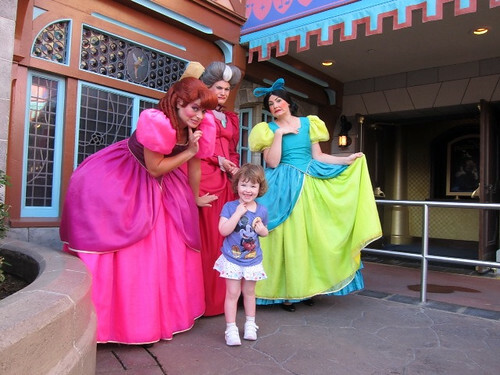 This is one pic of the dozen or so Disney characters she got to meet, not even counting the several dozen she saw in parades, or as we passed them in the park. She rode rides, stayed up to watch the fireworks, and was generally a complete champ with all the lines and crowds. She was awesome, and I’m sad we had to leave. It was the best thrill in the world seeing her so incredibly happy…she had, literally, the time of her life. So did Mom and Dad.